The Gallipoli Campaign was one of the greatest Ottoman victories during the war and a major Allied failure. In Turkey, it is regarded as a defining moment in the nation's history: a final surge in the defence of the motherland as the Ottoman Empire crumbled. The struggle formed the basis for the Turkish War of Independence and the founding of the Republic of Turkey eight years later under Mustafa Kemal Atatürk, who first rose to prominence as a commander at Gallipoli. The campaign is often considered as marking the birth of national consciousness in Australia and New Zealand and the date of the landing, 25 April, is known as "Anzac Day". It remains the most significant commemoration of military casualties and veterans in those two countries, surpassing Remembrance Day (Armistice Day). The Expeditionary Force, numbering at the outset 63,000 British, 47,000 Russian and 18,000 French troops, besides 36,000 horses, with General Ian Hamilton in supreme command, arrived off Gallipoli in five divisions on April 23, 1915. In all the history of warfare there is nothing to compare with the difficulties attending their landing at Gallipoli. There were no harbors, wharves or docks at which to land. The troops were compelled to debark in small boats and wade a hundred or more feet in water before setting foot on the low beaches. 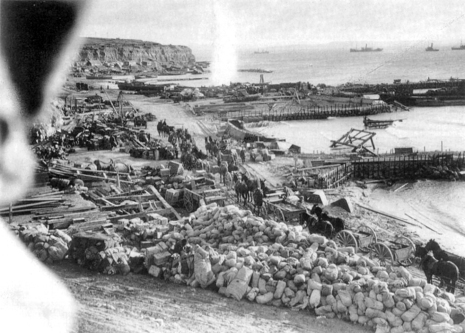 Three main landings were made; the 29th Division of British Regulars disembarked near Sedd-el-Bahr at the point of the peninsula, where its landing was protected by the warships in the Gulf of Saros ; the Australian and New Zealand troops disembarked north of Gaba Tepe; while a naval division made a demonstration further north. The Turks, in anticipation of the invasion, had strengthened their defences. Elaborate systems of trenches and redoubts had been constructed in front of the heights from end to end of the peninsula. The beaches had been lined with rows of barbed wire, some of them extending into the sea. The shores had been planted with mines, electrically operated, to blow the invaders into fragments. Concealed pits, machine-gun nests and other traps were prepared along the front. On the rocky uplands, rising in successive ridges above the beaches, batteries of howitzers and cannon were solidly emplaced, and prepared to belch forth their infernos of shell, lyddite and shrapnel. The general idea of the Gallipoli campaign was the capture of Constantinople (Istanbul) by an army marching through the peninsula and reducing the forts along the Dardanelles shore by successive rear attacks. The first objective of the army was the heights overlooking the Narrows, possession of which would enable the Allied artillery to sweep the Turkish fortresses on both shores. These forts had been assaulted in vain by the Allied battleships; evidently they must be taken, if at all, by attack from the rear. This would necessitate landing the army on the west shores of the peninsula, washed by the waters of the Aegean Sea. But first it would be necessary to capture the two dominating heights on the Aegean shore — that of Achí Baba 6,000 feet high, near the tip of the peninsula and overlooking the village of Sedd-el-Bahr; and Sari Bahr, 1,000 feet high, eight miles to the northward, overlooking Gaba Tepe and Anzac Cove. By taking Achi Baba and isolating Sari Bahr, the army would have a clear road through the low country to Kilid Bahr and the objective forts. It was a part of General Hamilton's plan to launch a surprise attack upon Achí Baba and to deceive the Turks as to his intentions by effecting a landing at separated points. Accordingly, it was arranged that the 29th English Division, composed largely of regular Scottish troops, led by Major-General Weston, should land on five adjacent beaches at the tip of the peninsula, then push forward to the village of Krithia and assault the Heights of Achi Baba from the northwest. Simultaneously, the Australian and New Zealand troops were to land at Gaba Tepe, 12 miles up the coast, taking possession of the road to Maidos, which runs between Sari Bahr and the heights of Kilid Bahr, and attack the heights from the rear. At the same time, the French forces, under General D'Amade were to make a diversion at Kum Kale on the Asiatic side of the straits while a squadron of battleships was making a diversion farther up the Gulf of Saros, these two last operations being in the nature of feints, intended to disconcert the Turks. At one o'clock on the morning of Sunday, April 25, 1915, transports carrying 36,000 Australian and New Zealand troops appeared five miles off the coast at Gaba Tepe, accompanied by a number of destroyers. Landing boats were at once lowered in the darkness and towed to shore in fleets of five by steam pinnaces. By a fortunate error the boats had been towed a mile above the selected point of disembarkation to a point steeply overhung by cliffs. Had they landed on the lower beach, as originally planned, they would have been subjected to the enfilading fire of the Turks. The beach on which the actual landing was effected is a strip of sand, forty feet in width and 3,000 feet in length, bounded on the north and south by small promontories. At its southern extremity, a deep ravine, lined with scrub, runs inland, while near the northern end of the beach a small but steep gully runs up into the hills at right angles to the shore. The mountain spur which forms the northwestern side of the ravine falls almost sheer excepting at the southern limit of the beach, where gentler slopes give access to the mouth of the ravine beyond. As the first fleet of landing boats reached the shallow water in front of the cliffs of Gaba Tepe, the Turkish lookouts gave the alarm and searchlights at once illumined the scene. Leaping from their boats, the gallant "Anzacs" waded through the shoal water to shore, amidst a tempest of bullets from the cliffs above. The Third Australian Brigade, led by Colonel Sinclair MacLagan, was first to reach land. Without hesitation, they charged the Turkish trenches on the beach, bayoneting the defenders, and advancing up the sides of the precipitous cliffs that rise 100 feet in air. Half way up the cliff, the Turks were intrenched in a strong position, but in 15 minutes they were swept out of their trenches. The plucky Australians then scaled the cliff and moved inland along the Maídos Road. 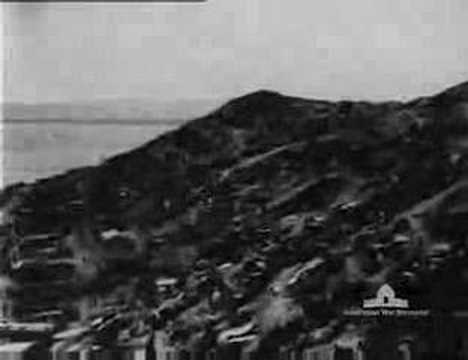 By this time, some 4,000 troops had landed on the narrow beach to the south, through a hurricane of bullets fired from the Turkish machine-gun batteries on the summit of the cliff. The landing boats, too, found themselves in difficulty. Three of the towing ropes had been cut by the Turkish shell-fire and the boats drifted helplessly under the withering fire of the Turkish gunners. Worse still, the Turks had drawn their heavy howitzers to the scene, and, with perfect aim, were hurling heavy shells at the Allied fleet, compelling its withdrawal. Unsupported by artillery, the brave Australians were now in dreadful plight. As the landing troops continued to splash through the surf on their way to the shore, the Turkish guns enfiladed the beach with a succession of shrapnel, machine-gun and rifle fire that took its toll in thousands. To assault the heights against such odds was beyond human strength. By 3 o'clock in the morning, some 25,000 Turkish troops had been rushed to Gaba Tepe and about the same number of Australian and New Zealand troops were assembled on the narrow beach. General Birdwood decided no further advance should be made. As a measure of protection, he began to contract his line. No sooner was this operation begun than the Turks launched a counter offensive, advancing in mass formation against the Australians, but they were driven back. Just before daylight, the Turks massed for a final attempt to push the invaders back into the sea. The brunt of the assault was borne by the Third Australian Brigade, which had been the first to land. Aided by machine guns, which had just been brought ashore, the Australians managed to stop the Turkish advance, though their losses were frightful. Finally, when evening fell, both sides rested from sheer exhaustion. The advanced line of Australian troops now held a precarious footing on the ridges overlooking the shore of the Gulf of Saros. The main British expedition, meantime, was debarking at five points along the tip of the peninsula near the village of Krithia. At 5 o'clock that Sunday morning, the Scottish Borderers and a battalion of the Royal Naval Division under Lieutenant Colonel Кое, landed on a narrow strip of beach, afterwards scaling the 200-foot cliffs without opposition. Having gained the heights, however, they were attacked furiously by a large Turkish force ; but resisted bravely. All day and into the next night, they sustained the murderous fire. At 7 o'clock Monday morning, after half the force had been killed, and when their food, water and ammunition were exhausted, the remaining British troops escaped to their boats, protected by a screen of fire from British warships. The 87th Brigade, under Brigadier-General Marshall, landed midway between Tekke Burna and Hellas Burna in a wide bay leading to a gully, flanked on one side by steep hills and on the other side by steep cliffs. The Turks occupied an almost impregnable trench position on the heights. Every inch of the ground on the beach below had been prepared against attack, with sea and land mines, wire entanglements and pits. After a preliminary bombardment by the supporting warships, the First Battalion, in 32 cutters towed by eight launches, approached the shore. As they leaped into the shallow water, the Turks opened fire upon them, cutting down the first line of the battalion to a man. The Second Battalion, nevertheless, advanced without faltering and endeavored to cut the wire entanglements on the beach. They, too, were swept away by the Turkish fire, only a remnant of the battalion breaking through the wire to the shelter of the bush-covered slopes. At this moment, the 88th Brigade, under Brigadier-General Hare, landed just below at Cape Hellas, and stormed the cliffs, expelling the Turkish gunners from their trenches with their bayonets. Presently the Turkish fire ceased, and the survivors of the Battalion were enabled to reform and advance upon Hill 114. Reinforcements were landed at 9 o'clock at Cape Tekke, the heights above being then in possession of the British. Three lines of Turkish trenches were carried. Preceded by an intense naval bombardment, the British now took Hill 138 by assault, the Turks resisting stubbornly. Further down the coast, near the village of Sedd-el-Bahr, a landing in large force was attempted on a narrow strip of beach swept by the cross-fire of the Turks, who were concealed amidst the ruins of the village. Barriers of barbed wire emplacements had been stretched, one line along the beach, another half way up the slope of the high hill. Behind this barrier were the Turkish trenches, and farther back there were many places of concealment. At this juncture, a huge transport, carrying 2,000 men, swung in along shore. Transferring to colliers, the newly arrived troops headed for the beach. Before they could land, however, the Turks concentrated their fire upon the foremost boats, killing half the occupants. The transport itself was now beached and the troops were transferred to lighters. As these boats headed for the shore, a storm of shrapnel burst over them, and so many of the men were killed that the attempt to land the 1,000 remaining troops on the transport was postponed till evening. This time it was successful. Some small parties were also landed at other points along the shore. In all, 1,500 British soldiers were brought ashore and found protection behind the escapement near the water's edge. Meanwhile, on the Asiatic shore, 3,000 French troops had landed at Kum Kale, and after storming the ruined castle, advanced toward the village of Yeni Shehr. So vigorous was the Turkish resistance, that the French were barely able to intrench. All through the night the battle continued. In the morning, having lost nearly 1,000 men, the French re-embarked under the protection of fire of warships. Only two of the seven landings attempted had been successful, those at Beach X and Beach W. Two others had been definitely abandoned. On the cliffs above Gaba Tepe, the Australians were bravely resisting the efforts of the Turks to drive them into the sea. The cove in which they had landed they named "Anzac Cove," the word Anzac being formed from the initial letters of the official name of the colonial expedition, Australian and New Zealand Army Corps. Their losses had been very heavy, but with all they were cheerful. Early on the morning of April 28, 1915, the Anzacs hauled their heavy field guns up the slope of the cliffs to the summit. Here they gave battle to the Turks, all day, but without gaining ground. Though wholly separated from the other landing parties and outnumbered, they managed to hold their own against the Turks. Some 1,500 men, meanwhile, had been landed on the tip of the peninsula, near Sedd-el-Bahr, and on April 26, 1915, following a heavy bombardment, they cleared the village, stormed the castle and took Hill 141, though at a high cost in men. By morning of April 27, 1915, several beaches were in possession of the British and the French. General Ian Hamilton united these forces for an assault upon the village of Krithia, from which point they intended advancing upon Achi Baba Heights. The men were exhausted and the few guns landed afforded them but inadequate artillery support. Ammunition was short and the water supply was nil. Advancing toward Krithia in two columns, the Allies were stopped when within a mile of the village, and driven back by superior Turkish forces. Only by hastily intrenching were the Allies able to hold their position. During the ensuing two days, the Anzacs were reinforced by six Motor Maxim Corps, who held the trenches while the Anzacs reorganized behind the line. Fresh reinforcements followed with heavy artillery. Late on the night of May 1, 1915, the Turks, creeping up on their hands and knees, leaped into the trenches of the 86th Brigade and bayoneted the defenders, but were unable to press the advantage. Similar raids were made all along the line, but most of them were repelled. At daylight on May 2, 1915, the Allied troops went over the top in a counter-attack, but being stopped by machine guns and barbed wire barriers, they retired to their trenches. The Turks countered during the next three days with such terrible effect that the British alone lost 25,000 men, killed, wounded or sick. The Lancashire Fusilier Brigade arrived from Egypt on May 5, 1915, and a fresh assault was made against the village of Krithia and the Heights of Achí Baba the next day. Though the Allies made advances of half a mile, in the end they were obliged to stop and intrench, so stubborn was the Turkish resistance. The French Senegalese troops especially distinguished themselves in this battle, falling like leaves in a gale as, again and again, they charged the Turkish trenches and machine-gun batteries. On May 7, 1915, the Allied warships united in a tremendous bombardment of the ground round about Krithia, but the shells failed to exterminate the enemy. Some hours later, when the Lancashire Fusiliers advanced across the open fields toward Krithia, they melted before the destructive fire of the Turks. Learning that heavy Turkish reinforcements were on the way, the British troops on May 8th made a last desperate attempt to carry Krithia by bayonet assault. Some units of the advance actually reached the Turkish line, but the assault in general proved a costly failure. Meanwhile, the Australians, at Anzac Cove, were being drenched with shrapnel. The Turks, aware that the Australian position had been weakened by the withdrawal of two brigades to assist in the assault on Krithia, launched a vigorous offensive. Beginning on May 5, 1915, and continuing five days, the position of the Anzacs on the top of the cliffs, along a front of half a mile, was bombarded at the rate of 1,000 shells an hour. The Turks, though unable to expel the Anzacs from the summit, nevertheless succeeded in preventing any reinforcements being sent to the British line. Here, too, a dreadful toll of death was taken. The Allies received strong reinforcements in the following week, and General d'Amade was succeeded as commander of the French forces by General Gouraud, the "Lion of the Argonne." The Turks, also reinforced, with a corps of 30,000 men, launched a powerful attack on the Anzacs at midnight, May 18, 1915. Preceded by a bombardment of the Australian trenches, the Turks advanced in close formation, and were met by a scorching fire from the Anzac line. For six hours the battle continued, the Turks being mowed down by thousands. Hundreds of Turks were caught in the barbed wire entanglements ; scores of others, upon reaching the Anzac parapet, were bayoneted. At length the Turks withdrew, after a truce had been called to give them the opportunity to bury their dead. The British and French troops spent the next two weeks in extensive mining and sapping operations, preliminary to a new assault upon the Turkish line along the Krithia front. On June 4, 1915, at noon, the mines were exploded and 24,000 British and French troops advanced a few hundred yards upon a front of four miles. Unfortunately, a gap existed in the Allied line between the French and English forces. The Turks pierced this gap and enfiladed the exposed wings of both the Allied armies, wiping out an entire British battalion and driving the French back with much slaughter. 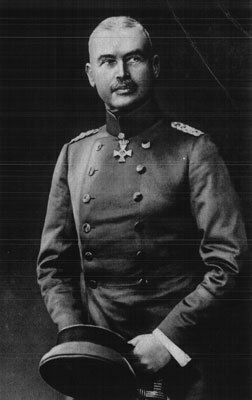 The French left wing, led by General Gouraud, stormed two lines of Turkish trenches on June 21, 1915, capturing the "Haricot" redoubt, which had twice changed hands. The French right wing, at a cost of 2,500 men, took the trenches above Kereves Dere in a gallant assault. General Gouraud lost an arm in this battle and was superseded by General Baillaud. The Battle of the Gully Ravine While a British warship shelled the Turkish position, a strong force of British infantry rushed and held five lines of Turkish trenches along the coast at the Gully Ravine. Further up the coast, Enver Pasha led the Turks in two unsuccessful attempts upon Australian position at Anzac Cove on June 29th. The Turks, on July 4, 1915, attacked the whole Allied line, at one time penetrating the British front, but they were finally driven back. Eight days later, the British advanced a quarter of a mile in the direction of Achi Baba, carrying a few yards of the Turkish line along a 50-mile front, but the Heights of Achi Baba still defied them. The British losses, by the end of July, were 50,000 in dead and wounded and as many more disabled by sickness. Of the original six divisions sent to Gallipoli, fully half were destroyed and a quarter more removed by illnesses. Several more divisions, aggregating 150,000 men, had been brought to the scene of slaughter. The French losses were about half as heavy as the British casualties. The German submarines and Turkish torpedo boats, meantime, had been active in Turkish waters. On May 12, 1915, the British battleship Goliath, while operating just inside the Strait, was sunk by a Turkish torpedo boat. On May 26, 1915, the battleship Triumph, while supporting the Australians near Anzac Cove, was sunk by a German submarine. The entire fleet then withdrew, and it became apparent to all military observers that the Gallipoli venture was doomed to failure. Early in August, while the Turks were celebrating the feast of Ramadan, the Allies made a final supreme effort to bend back the Turkish line. Fifty thousand fresh troops from England had arrived at Gallipoli— young lads who had never yet faced a battle line—and were landed at Suvla Bay, five miles north of Anzac Cove. Here they were joined by Indian Gurkhas. This landing place had the advantage of much open country stretching back from the beach on which to conduct maneuvers. It was planned that these troops, upon landing, should push forward to the Anafarta Hills, which rise 600 feet high, dominating the surrounding country. At the same time, the Australian troops at Anzac Cove were to assault the Heights of Sari Bahr, from whose crest thousands of Turkish machine guns looked down. While these two movements were in progress, the Greek Legion and the Cretian Volunteers were being transported in troopships to Karachali, on the European mainland, where a demonstration was to be made to prevent any reinforcements being sent to the other battlefields. Finally, a new offensive was to be launched at Krithia to hold all the Turkish troops at that point and prevent their being shifted to Sari Bahr and the Anafarta Hills. 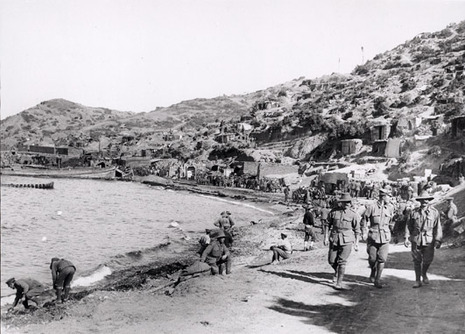 On August 7, 1915, the Australian troops moved out from Anzac Cove in two columns to attack the Heights of Sari Bahr. The right wing advanced in three lines to storm the Lone Pine Plateau. The first line was totally annihilated. The second line shared a similar fate, only a few survivors reaching the trenches, and they were either bayoneted or captured. The third line was called back in time to save it from similar destruction. On the next day, however, an assault upon the same position was successful, the Australians capturing and holding the Turkish trenches. The left wing of the Australian Army, 600 strong, advanced in three columns toward the opposite slopes of Sari Bahr. 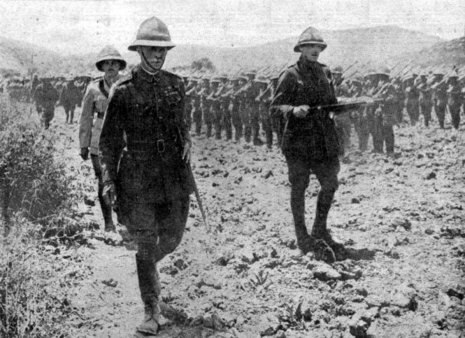 On the evening of August 6, 1915, one column of Australians moving toward Koja Chemen, barely escaped capture and retreated to the base at Asman Dere. A column of New Zealanders, weighted down with full kits, food and water, scaled the steep sides of Rhododendron Ridge, swept the Turks from the crest, and charged up the southwestern slope of the main peak of Sari Bahr. 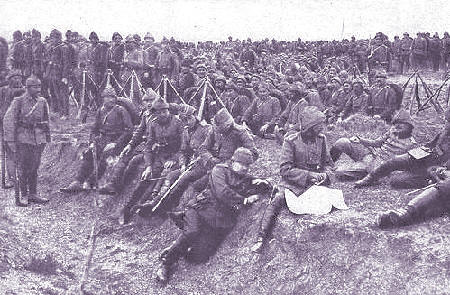 Here they intrenched, repelling repeated charges of the Turkish infantry. The column of Indian troops also gained ground in the vicinity of Hill 2. At daybreak, on August 9, 1915, the Allied troops made their final supreme assault on the Heights of Sari Bahr. First, the Allied warships in the bay opened a furious bombardment of the Turkish trenches. Then, with a yell that echoed for miles, the British troops sprang from their trenches and charged up the steep slopes. The Indian troops, with the Gurkhas in the forefront, scaled the heights in a twinkling. At once, the Turks concentrated their gunfire upon them and upon the New Zealanders who were supporting them on the left. This was followed by a furious Turkish charge which drove the Indians and New Zealanders down the mountain sides. The English and Indian troops, operating from Suvla Bay, meanwhile, had advanced on the flank of Sari Bahr. The Irish troops stormed and captured Chocolate Hill on the night of August 8, 1915, but failed to make connections with the Australians' who were being pressed on the opposite slopes. Three days passed before the Suvla Bay forces succeeded in coming to the aid of the Australians. The delay was fatal, for the Turks had rallied in great force and driven back the Australians from all the positions they had gained on Sari Bahr. Had the Suvla Bay troops been moved more quickly, the Turkish stronghold might have been taken and the way opened to the forts on the Dardanelles. On August 15, 1915, the same Irish troops that had taken Chocolate Hill succeeded in rushing Dublin Hill in a hand-to-hand fight with the Turks. On August 21, 1915, the Australians drove the Turkish defenders from the crest of Hill 60. The Turks had hurriedly fortified all the other hills surrounding Sari Bahr, and all efforts to take them by assault proved abortive. The Allied commanders, now convinced the Gallipoli campaign was a failure, withdrew their troops from Anzac Cove and Suvla Bay, leading a small force of British and French troops at the tip of the peninsula to face the brunt of the Turkish assaults. It was fortunate for these troops that the rainy season had now set in, rendering it difficult for the movement of Turkish guns and armies. The Turks contented them- selves for weeks with shelling the Allied line near Krithia at intervals, while they in turn, faced a vigorous bombardment from the British warships off the coast. Following the failure of the Gallipoli campaign, on Oct. 28, 1915, General Ian Hamilton was succeeded in supreme command of the Expeditionary Forces by General Sir Charles Monroe. Upon his recommendation, it was decided to evacuate the peninsula, and Monday, December 19, 1915, was the day set for the withdrawal of the troops. Under the protection of a strong fleet of warships, the troops at Sulva Bay and Anzac Cove were safely removed at 3 o'clock in the morning without knowledge of the Turks. By January 9, 1916, the last of the Allied troops had left the peninsula. 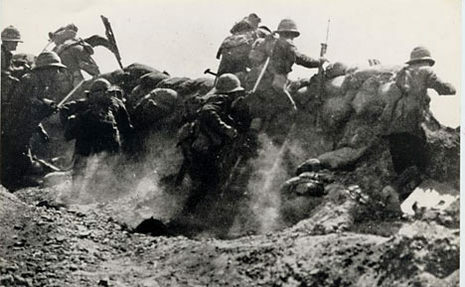 The British casualties during the Gallipoli campaign were 112,921. To these must be added 96,683 soldiers and marines who had been sent to hospitals. In addition, the British lost six battleships, enormous stores of ammunition, many guns and much prestige among the Mahometans throughout the British Empire. The Turkish losses were estimated at 50,000, while the French were at least 25,000. Having established two beachheads at great cost Hamilton determined to extend the Allied position in the south, with attacks directed towards Krithia. Unduly optimistic in its aims three successive operations were launched upon Krithia by Hunter-Weston in April, May and June 1915: all were thrown back by Liman's increasingly effective Turkish defence force. Meanwhile British First Sea Lord Admiral Fisher's dramatic resignation on 15 May 1915 over Churchill's handling of the Gallipoli campaign led to the latter's own downfall as Churchill too resigned, his wartime political career apparently effectively over. Churchill had earlier, on 23 March, reluctantly admitted the failure of the purely naval bombardment to the War Cabinet, denting his already frail political credibility.